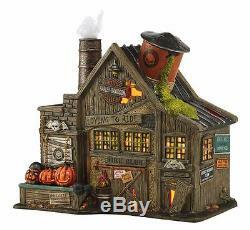 Department 56 Halloween Village Harley Davidson's Ghost Riders Club 4044878 New. Part of the Halloween Village by Department 56. Approximately 8.5 inches tall (21cm). Includes original manufacturers box and packaging. The Ghost Riders gather at this club house, but not for long - they are dying to ride. Officially licensed by Harley Davidson. DecorationWarehouse and Home and Holiday Shops appreciates your business! The item "Department 56 Halloween Village Harley Davidson's Ghost Riders Club 4044878 New" is in sale since Monday, April 03, 2017. This item is in the category "Collectibles\Decorative Collectibles\Decorative Collectible Brands\Department 56\Halloween". The seller is "decorationwarehouse" and is located in Tempe, AZ. This item can be shipped to United States, Canada, United Kingdom, Denmark, Romania, Slovakia, Bulgaria, Czech republic, Finland, Hungary, Latvia, Lithuania, Malta, Estonia, Australia, Greece, Portugal, Cyprus, Slovenia, Japan, China, Sweden, South Korea, Indonesia, Taiwan, South africa, Thailand, Belgium, France, Hong Kong, Ireland, Netherlands, Poland, Spain, Italy, Germany, Austria, Russian federation, Israel, Mexico, New Zealand, Philippines, Singapore, Switzerland, Norway, Saudi arabia, Ukraine, United arab emirates, Qatar, Kuwait, Bahrain, Croatia, Malaysia, Brazil, Chile, Colombia, Costa rica, Dominican republic, Panama, Trinidad and tobago, Guatemala, El salvador, Honduras, Jamaica, Antigua and barbuda, Aruba, Belize, Dominica, Grenada, Saint kitts and nevis, Saint lucia, Montserrat, Turks and caicos islands, Barbados, Bangladesh, Bermuda, Brunei darussalam, Bolivia, Ecuador, Egypt, French guiana, Guernsey, Gibraltar, Guadeloupe, Iceland, Jersey, Jordan, Cambodia, Cayman islands, Liechtenstein, Sri lanka, Luxembourg, Monaco, Macao, Martinique, Maldives, Nicaragua, Oman, Peru, Pakistan, Paraguay, Reunion.